Images and tattoo artwork involved in the images above are property of United Ink Tattoo & Body Piercing Studio located in Pigeon Forge, TN. 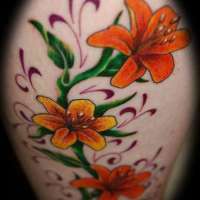 United Ink Tattoo & Body Piercing Studio, a tattoo studio located in Pigeon Forge, TN. The studio's staff includes tattoo artists such as Nick, Reno, and Ben. The studio has a 4.8/5 combined rating from 242 reviews. This rating is a combined value of the studio's Facebook Page and Google Places Page. Images are property of United Ink Tattoo & Body Piercing Studio located in Pigeon Forge, TN. This studios listing information was last updated 7 months ago.